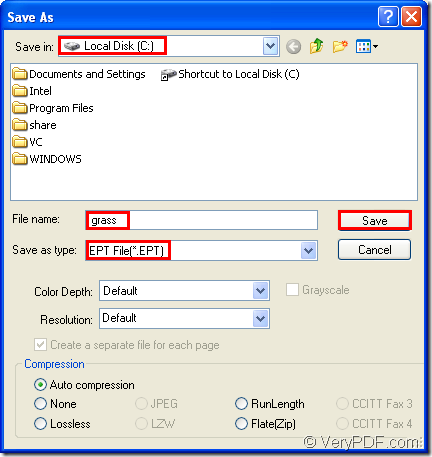 ← How to convert files of AutoCAD to epi? You may never hear of docPrint Pro before. You may never get a task to convert AutoCAD to ept format file, either. So how to convert files of AutoCAD to ept will be a problem hard to deal. But with docPrint Pro, everything will come to be no more easy. Because docPrint Document Converter Professional(docPrint Pro for short) is a software product that dynamically converts MS Office 97/2000/XP/2003/2007, WordPerfect, AutoCAD DWG, PostScript, Adobe Acrobat PDF and many other document types to Adobe Acrobat PDF, PostScript, EPS, XPS, PCL, JPEG, TIFF, PNG, PCX, EMF, WMF, GIF, TGA, PIC, PCD and BMP etc formats. It works in GUI version , Command Line version and virtual printer. With docPrint Document Converter Professional you can convert your documents from and to 50+ formats easily. This article will focus on the method to convert AutoCAD to ept format file with the virtual printer in docPrint Pro—docPrint. You can download docPrint Pro at http://www.verypdf.com/artprint/docprint_pro_setup.exe first and install it in your computer. 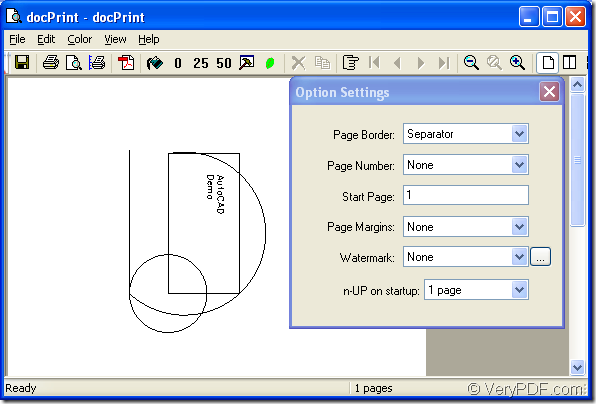 Then print a document to "docPrint", you will be able to start using Document Printer software. Open a dwg document and click “File”—“Plot” to open “Plot-Model” dialog box. 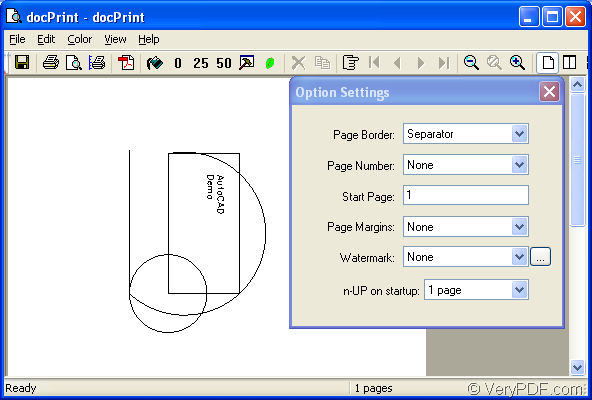 Then you can choose “docPrint” in “Name” combo box of “Printer/Plotter” group box and click “OK” button to close the dialog box and continue the work. The other way is to use the hot key “Ctrl”+ “P” to open “Plot-Model” dialog box. In popup “docPrint” dialog box, you can try to follow the methods below to open “Save As” dialog box. Please see Figure1. You can click “File” and click “Save as” in the dropdown list. You also click the icon in the toolbar and to open “Save As” dialog box. The hot key “Ctrl”+ “S” can also aim at the same goal. You can choose anyone of the methods which are available. In the last dialog box, “Save As” dialog box of the conversion of AutoCAD to ept, you should do following operations. Please see Figure2. Please choose a suitable for the target file in “Save in” combo box, and edit the name for the target file in “File name” edit box. 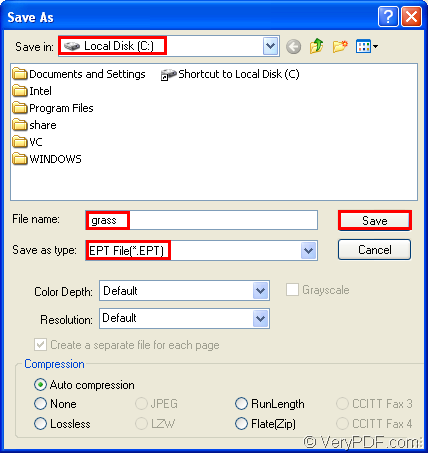 You should choose a right file type for the target file in “Save as type” combo box. Then click “Save” button to close the dialog box and run the conversion. Mentionable, the conversion speed is as fast as blink and you will see your target file in specified location. What is the difference between 101DPI and 300DPI TIFF files and will we get different TIFF files if I choose different DPI option in PDF to Image Converter? How to convert MS Office Excel documents of XLS to PIC? How to convert documents of HTML to TGA?